....the science between combining birthdays. Often, as a children's event planner and especially during these tough economic times, I am asked by clients, friends and family about how to combine a birthday for siblings, often the children are of differing sexes and usually under the age of 5. So what are some cost effective suggestions to get you started in the right direction? I am glad you asked. First, look for commonalities. Maybe your adorable offspring both like a common television show, color or activity. That commonality could become your central theme. Some gender neutral themes are Sesame Street, Mickey and Minnie (the yellow, blue, red and polka dots could be too fun! ), safari (think pink and blue safari helmets... too cute right?). Don’t forget the ever favorite pirate and princess or knights. Even favorite books and colors can be springboards for fantastic party themes. If you have a girly girl and a tough boy remember that you can play with colors within a more masculine theme to suit the girls. 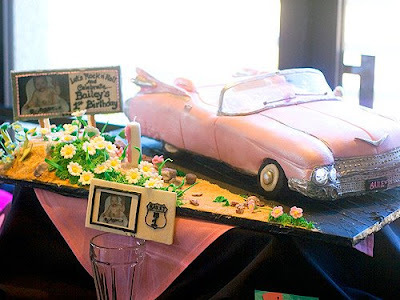 I know my girls would love a Barbie convertible to play with at their brother's monster truck themed party! My youngest daughter would opt out of the pink entirely and go for the lifted one with some knobby tires! Most importantly, remember kids are simple and birthdays are about celebrating time with one another. The best party is one where friends and family can smile, laugh and make memories together. Here's wishing you a million wishes and endless happily ever afters! 1.Pick a two year old friendly theme. By now you have giggled to countless hours of play, music and television. Pick a theme that your toddler easily recognizes to create the unifying theme for the celebration. Your theme could come from things as simple as your child's favorite color, book, toy, song or video. Themes like Little Einsteins, Mickey Mouse Club, Pink Cupcake and Mod Monkey all have fantastic colors and activities that easily lend themselves to many creative and fun decorations and games. 2. Keep your guest list manageable. Two year olds are often overwhelmed by the excitement of a big day. It may be difficult to resist the urge to invite the entire preschool class or playgroup but limiting the number of guests you invite to an intimate few will help reign in the budget and stave off the birthday meltdown experienced by an overstimulated toddler. 3. 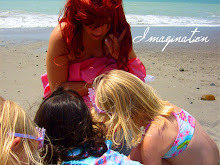 Pick toddler friendly, open ended activities. Two year olds are not capable of cooperative group play yet and sharing is a concept that is yet to be mastered. Instead of group activities opt for individual activities that can be played side by side such as play dough, coloring, sand box and bubbles. Be sure to have enough play items for each guest and encourage the parents to remain close to their child at each play station (and peaceful playtime) by providing adequate seating around the area of play. Dont forget small tables to free parent's hands for more hands-on play. Haute Mom: Gwen Stefani welcomes Zuma Nesta Rock Rossdale! Two months after giving birth, Gwen Stefani is showing off her newest bundle of joy: Zuma Nesta Rock Rossdale. The singer, who was spotted with the newborn at a Beverly Hills library on Wednesday, posed with son Zuma in a photo taken by her father, Dennis, and posted on No Doubt's Web site. Hermés Gustaf Daniel Giersch celebrated his second birthday in style on October 19th with a Gymboree Play-and-Music-themed party. 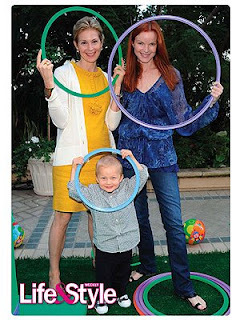 Mom Kelly Rutherford and fellow Melrose Place alum Marcia Cross tried their hands at hula-hooping, while Hermés joined in on the fun. "He's curious about everything," explained Gossip Girl star Kelly. Hermés may be getting a sibling in the future -- Kelly, 39, recently revealed that she is planning another child with husband Daniel Giersch. Haute Mom: Dayna Devon of EXTRA celebrates her daughter's 3rd. EXTRA correspondent Dayna Devon loves hosting parties, and daughter Emmi Reese's third birthday was an occasion to throw one! Pink princess Barbie was the main theme for the September bash -- complete with a fuchsia carpet -- as Emmi's friends arrived in their frilliest dresses. 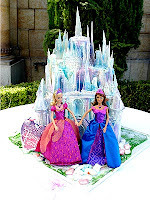 Guests dined on pink lemonade, heart-shaped sandwiches, and a towering Barbie Castle cake, then gathered in a cozy movie tent for a screening of Barbie and the Diamond Castle with Barbie herself! 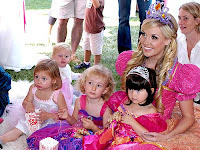 Haute Mom's Tip: Invite your guests to come dressed up as princesses to cut costs and take the guess work out of providing dress up costumes. Provide a table of fun and frilly dress up accessories like rings and neclaces to take the fun over the top! Haute Mom Britney Spears throws a Monster Jam for Jaden and Preston. Britney Spears revved up the celebration for sons Preston and Jayden on Saturday, throwing her sons a joint car and truck-themed birthday bash in Los Angeles. And the party was truly a family affair. Spears celebrated her boys' special days – Preston turns 3 on Sept. 14, and Jayden turned 2 on Sept. 12 – with sister Jamie Lynn Spears, her newborn niece Maddie Briann, dad Jamie and mom Lynne. Held at close friend Adrienne Maloof-Nassif's Beverly Park house, the outdoor party drew some famous guests, including Jenny McCarthy with her son Evan, and Gwen Stefani's son Kingston, 2, who came to the bash from an equally starry affair: He celebrated Heidi Klum's son Henry's 3rd birthday at the model's Beverly Hills house along with all three of Victoria Beckham's sons.But the guests of honor seemed to be having the best time. 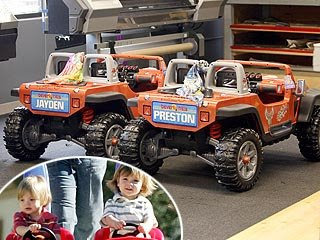 Preston and Jayden drove around the party in mini motorized cars, which were customized Ed Hardy by Christian Audigier. The cars featured tattoo-inspired decals, Ed Hardy air fresheners and personalized license plates. To keep with the party's theme, the cake was in shape of a yellow truck. " 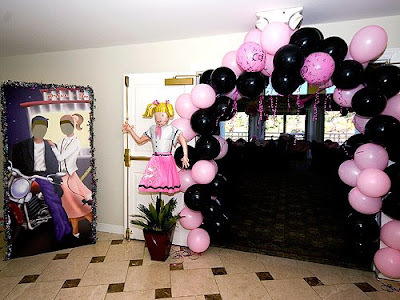 Haute Mom's Tips: You too can throw a great monster truck themed party like Britney. Think of match box car party favors, make personalized licence plates for bikes as a craft and fun games of red light green light. CLICK HERE to sign up for the FREE Monster Jam Birthday Club! Receive a birthday card in the mail from the superstars of Monster Jam along with special offers during your birthday month!